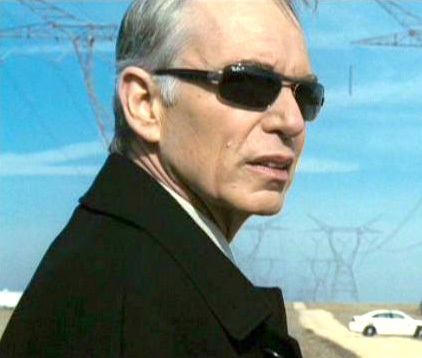 According to Luxottica, the manufacturer of Ray-Ban, actor Billy Bob Thornton wears Ray-Ban RB 3302 sunglasses in the 2008 movie Eagle Eye. 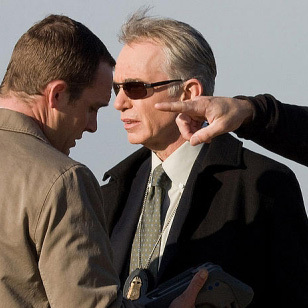 The exact color of the Ray-Ban sunglasses that Billy Bob Thornton is wearing is Gunmetal frame and Green Polarized lenses, color-code 004/58. Ray-Ban sunglasses style RB 3302 is a classic and stylish metal frame. The RB 3302 is designed with adjustable nose pads and temple tips for maximum comfort. Featured on the temples and on the right lens is the signature Ray-Ban logo. All Ray-Ban sunglasses have scratch/impact-resistant lenses that ensure 100% UV protection & superb optical clarity. The glasses are available with normal lenses and Polarized lenses. The Polarized version is usually around $40 more expensive.